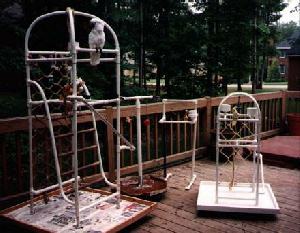 >Custom Playgrounds From KG KAT AVIARY of Chesapeake, Va.
All Playgrounds are made on a rolling base sized to fit through your doorways. 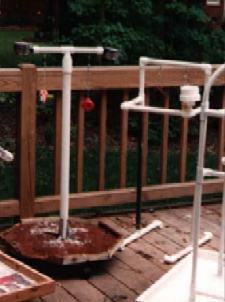 All are detachable from the base so that you can put paper down to catch droppings and food. Can be made with or without dishes. Can be done from your design or ours. Maximum height made so that eye level of bird is below your eye level to conquer that dominance problem in some species. 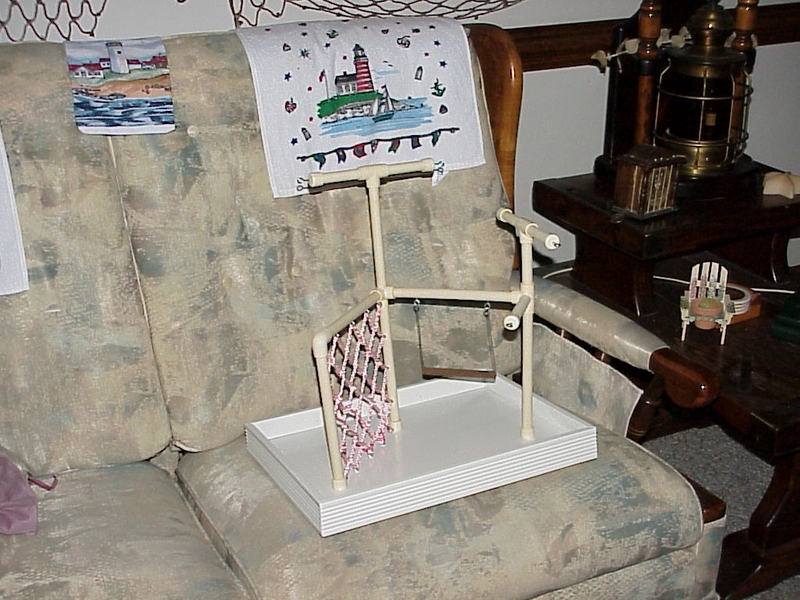 These are Tori's playgound and T-Stands. 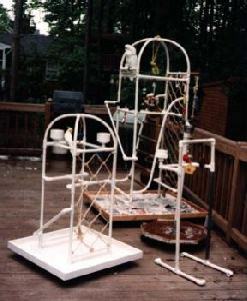 The playground is on a base that is 38"x42" and 83" high. Tori has never had a dominance problem. She steps up even at the highest level on command. 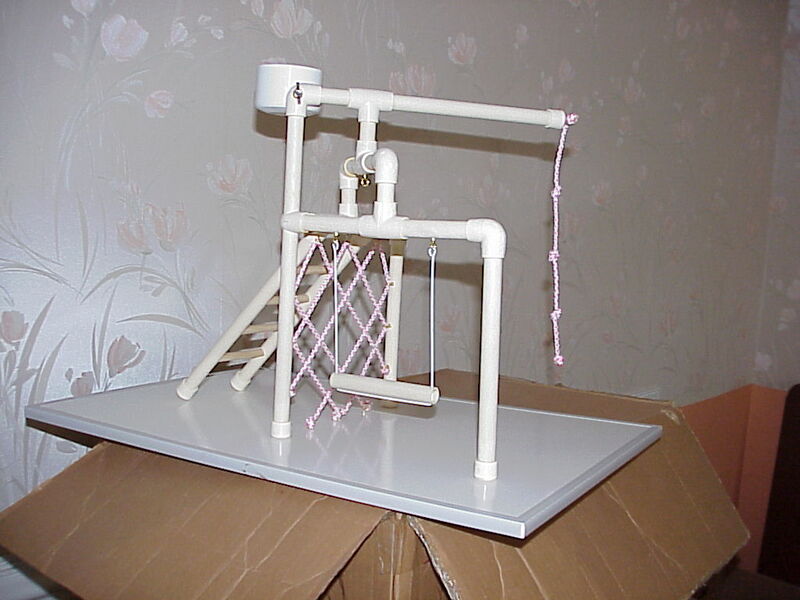 Hers has a ladder and fish net for climbing. 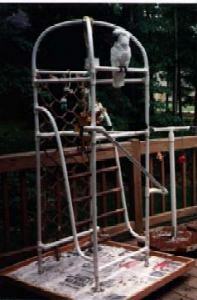 A slide for sliding and a hanging rope for swinging and twisting. 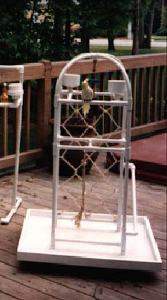 Hooks are provided for toys. Tori has T Stands for the other two areas of the house that she goes to often. Each one has 2 dishes and 2 hooks for toys. Finally got pictures of the table tops that we do. Here's a completed one and a scatch of others that can be done.